Slate Hearths Vs Granite Hearths – Which Should You Buy? 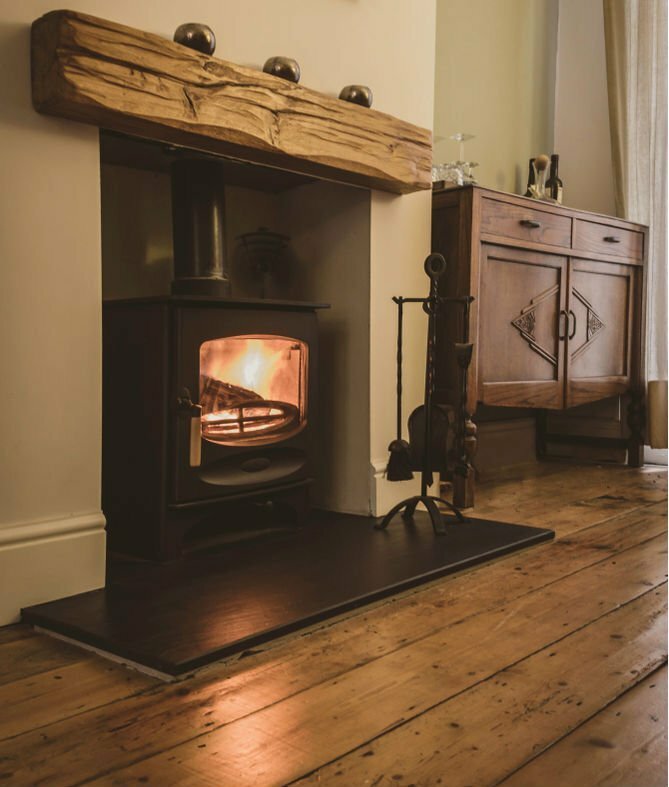 Standalone stoves not only keep your interiors warm and cosy but can add a touch of old-world charm and elegance too. With spectacular designs in both traditional and contemporary styles, they definitely increase the value of your property. To get the most out of your lovely stove, be sure to invest in the most suitable hearth. There are many options, with slate and granite being two of the most popular choices. Let’s compare the two to help you choose the one that best suits your taste and requirements. Both slate and granite are strong enough to absorb the extreme heat that a stove produces although granite is more resistant to this. They don’t crack easily and are not readily affected by glowing embers or flying ash. Granite hearths are more resistant and can withstand the intense heat of a crackling wood or coal fire. Both slate and granite are strong and durable stones. Slate is a metamorphic rock derived from a shale-like sedimentary rock, which makes it softer than granite. Granite, on the other hand, is an igneous rock derived from the solidification of magma below the earth’s surface.which gives it unbelievable strength and durability. It is an extremely hard and tough stone with high density and compressive strength. Granite hearths are significantly less impervious to scratches, scuffs, chipping or cracking. Slate is a virtually non-porous stone. This means your slate hearth is almost stain-proof and retains its beauty for decades. With slate hearths, you won’t have to seal or reseal the surface to protect it from staining. All hearths are sold unsealed. Granite, on the other hand, whilst relatively non-porous, absorbs stains and spills more easily.. You may wish to treat your granite hearths with a sealant during installation so as to protect the surface from staining. Maintenance is often a big factor when choosing a hearth for your fireplace. Both slate and granite require a little maintenance.. As slate can scratch easily, it is advisable to clean your slate hearth every day. This is to ensure there is no debris or dirt particles left that can scratch the surface. Granite stains more easily, however, when treated with a sealant, that problem is solved to a great extent. Just mop off any accidental spills immediately before it soaks through. Both granite (smooth matte or polished finishes) and slate (smooth or riven finishes), offer something for everyone and offer a natural but impressive choice for your stove to sit on. Being an igneous rock, granite is composed of different minerals like feldspar, mica and quartz; lending their own unique colour and texture. Slate is a metamorphic rock formed from high-pressure solidification of shale or mud deposits. What Type of Stone is Ideal for a Stove Hearth? Of all the materials available, natural stones are one of the most preferred choices for hearths. And there are several options for you to choose from. You can either go for limestone, slate, granite or sandstone. Each of these stones is perfectly suited for hearths and has their own unique look, character and benefits. It all depends on your personal liking and the decor. Let’s take a look at what makes each of these natural stones perfect for your standalone stove. Limestone is stunningly beautiful and astonishingly affordable. It is a highly fire-resistant stone that can absorb heat without cracking. Limestone hearths do not damage easily from falling embers or ash, making them a good choice for your stove. Hearths made of limestone are highly resilient and do not dent easily. They are also resilient to scratches and the impact of regular exposure to heat. These hearths are very durable and can last for decades. You can safely invest in these fantastic hearths with complete confidence. Limestone can be easily carved into any shape. Hearth plates made of limestone can be customised to fit your fireplace perfectly (maximum dimensions 1150mm x 1000mm). Limestone hearths are also very pleasing to the eye and come in both traditional and contemporary shades of cream and blue-grey. Slate is a naturally occurring sedimentary rock that serves as an excellent material for hearths. Slate has a unique, uneven texture and riven and smooth slate is available.to order in bespoke sizes up to 1150mm x 1000mm. Irrespective of your existing decor, a slate hearth is guaranteed to increase its aesthetic appeal. Slate hearths have excellent fire resistance and are extremely tough. Granite is also a good choice when you want a premium hearth with all its practical benefits. Granite can withstand high heat and is perfectly compatible with gas, electricity or solid fuel stoves such as coal or wood. For a more rustic look, choose a granite hearth with its natural matte colour with a smooth finish or opt for a polished surface for a trendier look. Granite is also a very tough and durable stone and impervious to the effects of high heat. Once installed, your granite hearths will require almost no repair through the years. Sandstone is a non-combustible natural stone that is a top choice for hearths. It is a thick and dense stone with a great capacity for thermal absorption and retention. It is not easily damaged by flying sparks or glowing embers. 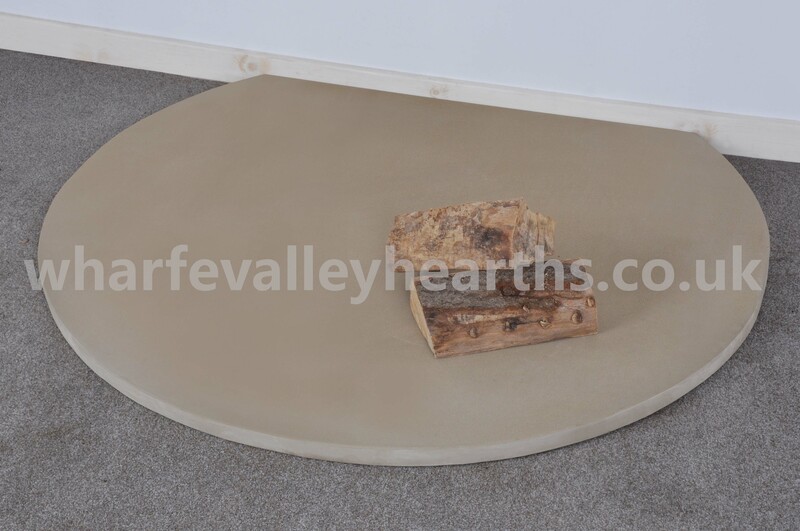 Sandstone hearths are vailable in muted beige or grey. 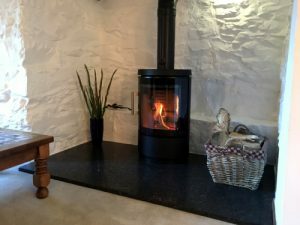 When it comes to choosing a hearth plate for standalone stoves, concrete is often the first choice and not without reason. Concrete is a composite material that is versatile enough to have a wide range of applications in construction. Add to that the several unique features and you have a material that is just perfect for the hearth plate of your fireplace. Concrete can be moulded in various shapes and sizes including the Teardrop, Square and Clipped Corner Square and are made to order. Concrete hearths not only complement your standalone stoves perfectly but are astonishingly affordable. Furthermore, concrete hearths add a touch of raw strength and beauty to your room and look extremely trendy when paired with the right decor. Concrete is one of the strongest and most durable materials available for various purposes including hearth plates. Few other materials last as long as concrete hearths do. Concrete hearths are a great long-term investment meaning you can enjoy them for generations as the material is extremely durable, can withstand extreme heat without cracking. In fact, concrete becomes stronger over the years however concrete can chip due to being made up of lots 1000’s of particles. Concrete can not only absorb high heat but it is non-combustible too. This means objects adjacent to your fireplace will never be affected due to transmission of heat. Being an inert composite material, concrete once set, has zero emissions. With concrete hearths in your rooms, you will not be exposed to any toxic vapours or emissions from volatile organic compounds (VOCs) from this product. Concrete is a material that does not rot, rust or burn. It is resistant to moisture and does not encourage the growth of bacteria or mould. Maintaining a concrete hearth is therefore very easy and just perfect for busy families. Another huge benefit of concrete hearths is quick and fuss-free installation. Whether your stove occupies the pride of place right in the centre of the wall or a tidy corner, we have a design for you. Concrete hearths are made to order. Once it arrives, all you need to do is unpack your bespoke concrete hearth and place it beneath the stove. It’s that simple! Before central heating systems made their way into our homes, people depended on fireplaces to keep their interiors warm during winter. These days, the modern heating system has made the fireplace redundant. However, fireplaces can add a lot of charm and character to your space. This is all the more true of trendy standalone stoves with their outstanding looks and modern design. Paired with the perfectly styled hearth plate, your fireplace can become the focal point of your room. With the winter setting in, this is the right time to install a fireplace to recreate the elegance of old-world ambience. A fireplace with the right hearth will make your winter evenings extra special, cosy and extremely relaxing. When it comes to choosing the right floor plate for your fireplace, slate hearths are an excellent option. Let’s take a look at the various advantages it offers. Slate is a fine-grained rock that can be cut and shaped into smooth and stylish pieces. It is available in shades of grey from dark to pale, which creates an aura of subdued sophistication in any space. However, slate can also be cyan, bluish, purple or even green in colour. The variations in colour offer you complete flexibility when using slate hearths for your fireplace. Irrespective of your decor, you are sure a find a shade of slate that will be fit in perfectly with your interiors. Slate hearths not only look stunningly beautiful but are high in performance too. Slate is totally fire proof and extremely energy efficient. It has great thermal stability, which means the heat does not transfer easily to the exterior of your fireplace. Slate hearths are compatible with electricity, gas or solid fuels like coal or wood. What’s more, these hearths are extremely durable and resistant to staining. Slate is also inert to chemicals and does not encourage the growth of bacteria or fungus. Slate hearth plates are very easy to install. Simply choose the style and shape of your slate hearth from our collection and place your order. We will deliver your chosen hearth plate to your home or place of business in no time. 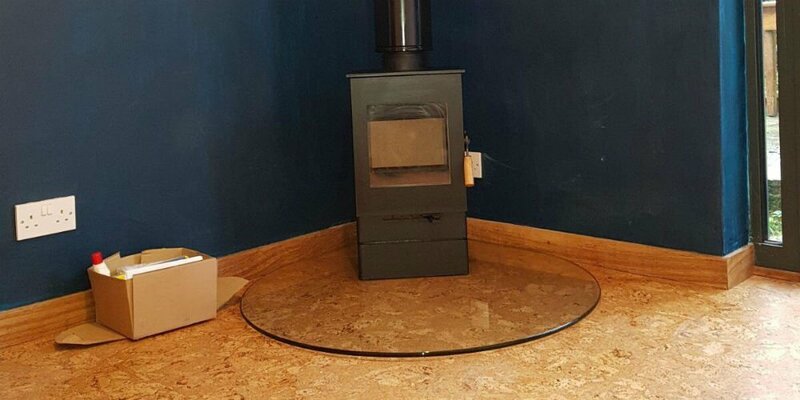 Simply remove the slate hearth from the packing and place it on the floor and you’re done. Maintaining your slate hearth is easy and totally fuss-free. Since slate is fire proof, chemically inert and resistant to staining and bacterial growth, it does not require elaborate scrubbing or cleaning. Regular dusting is enough to keep your slate hearth plates bright and shining through the years. Slate can be cut and crafted in different dimensions to suit various spaces. At Wharfe Valley Hearths, slate hearths are available in standard sizes that comply with the building regulations. Our slate hearths offer complete safety as they’re sure to catch any glowing embers and flying ash before they damage your floor. And with different colour options, you can enjoy your unique bespoke fireplace with slate hearths that are available in different designs like semicircle, square or teardrop. Need Help Choosing The Right Hearth for Your Stove? The primary factor to consider when buying a hearth is the kind of material it is made of. Stove hearths are made of highly fire-resistant materials as they need to catch flying embers, ash and sparks, and prevent them from causing any fire accident. Hearth plates are available in wide variety of attractive and durable materials. Let’s take a look at some wonderful options. Sandstone is one of the earliest known materials to be used for stove hearths. Sandstone is non-combustible and it’s natural density makes sandstone more fire resistant as flames find it difficult to wade through it. These sandstone hearths boast a timeless appeal. They are highly tough and durable and easy to clean and maintain too. These hearths retain their colour for a long time. If you are looking for an inexpensive hearth plate, limestone hearths fit the bill. Limestone hearths are highly resistant to daily wear and tear. These hearths are a great option if you are looking for lighter shades. Concrete hearths are timeless in their appeal and go with any kind of décor. Whether you are looking for a traditional or contemporary look, concrete hearths can deliver the desired effect. Given its natural composition, concrete is a highly non-combustible material. Moreover, concrete spreads heat slowly, which serves as an extreme protection against fires. Granite is a popular material used for its unmatched beauty, durability and versatility. Granite hearths are great for gas, electric as well as stoves with solid fuel. These hearths are less expensive than soapstone and marble and are available in different patterns and colours. If you are looking for darker shades, get a slate hearth. 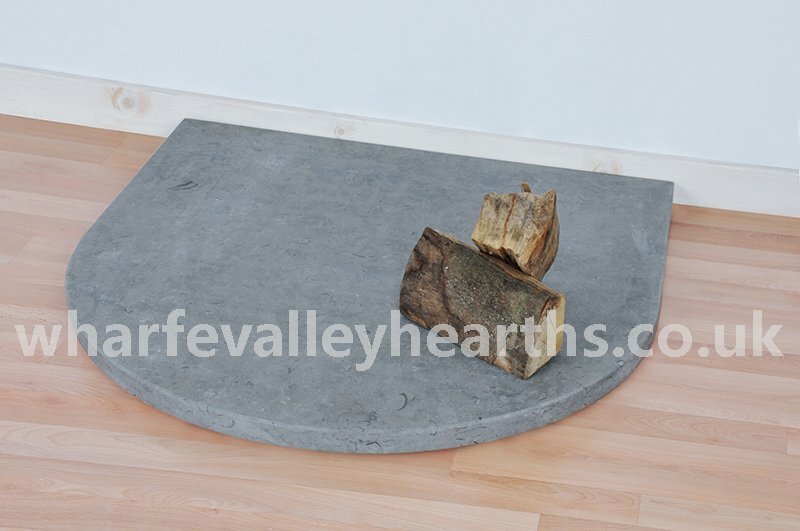 These hearths are extremely durable, usually lasting for years. But, slate hearths need to be used only with electric and gas stoves, and not with solid-fuel stoves, for they crack under the pressure. 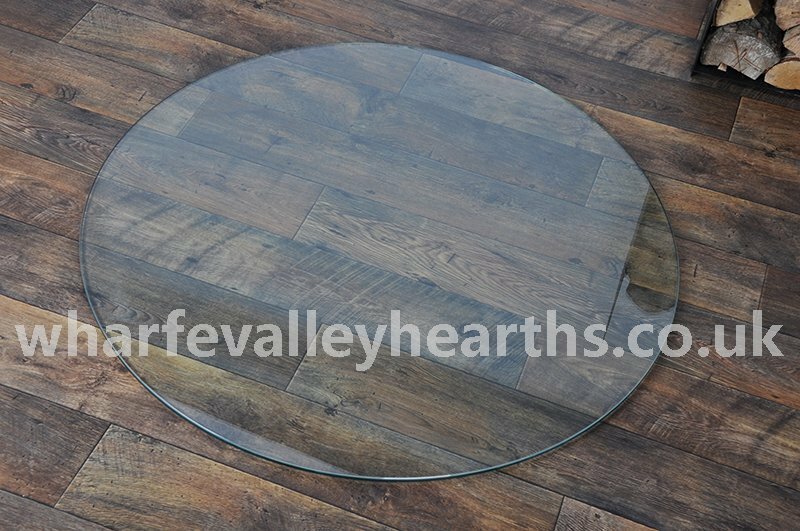 If you want to show off your floor without covering it with a hearth, glass hearths are the ultimate choice. They are timeless in looks, and extremely tough and durable. The hearth size is also an important consideration. The Building Regulations Act specifies the dimensions needed for the hearth so that it protects occupants from fire hazards. 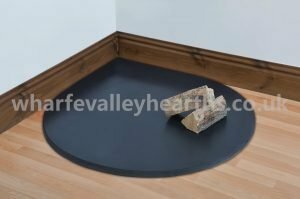 If you are thinking of hearths, think of Wharfe Valley Hearths. We have a range of hearths in slate, granite, sandstone, limestone, granite, concrete and glass, in different shades and shapes. Whether you want to position your stove in a corner or edge, we have a shape to suit your priorities. We also cut hearths to your specifications. Call us at 01937 859243 for more information. 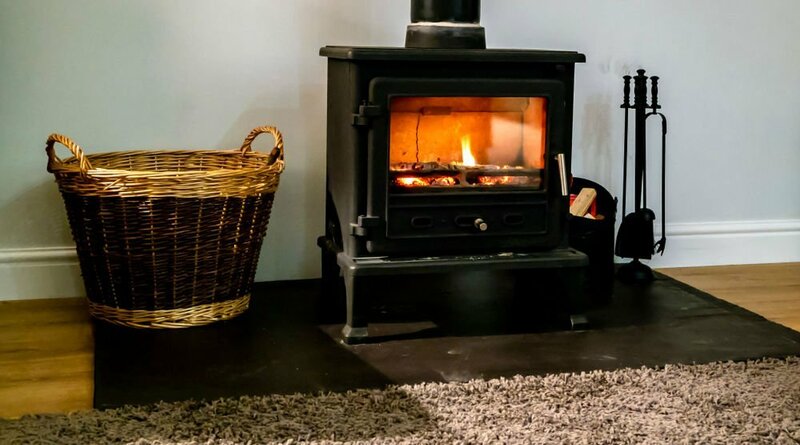 When used within safety limits, wood burning stoves are great to have, in any home. They keep you warm and cosy during the cold, harsh, winters. With modern stylish wood stoves, you can also enhance the décor of your home. With the right safety precautions in place, you can enjoy this amazing appliance for a long time. Ensure that the carpet or other combustible materials such as rugs are away from the stove – even small embers can cause fires. Choose your flooring covers carefully. Floors made of brick or linoleum are ideally suited for the purpose. The air vents on a stove allow you to adjust the oxygen levels so that you can fire the fuel per your requirements. However, an overdose of oxygen can burn up all the fuel and overheat your stove. It is crucial to keep the air vents at lower levels during the nights. Remember to adjust them when you are planning to take a long vacation. Leaving them at a higher level can result in fire accidents. Avoid using lighter fluids to start a fire in the stove. This could result in an explosion. Avoid using charcoal too. Charcoal emits carbon-monoxide, which when inhaled steadily, can even lead to death. Use split, well-seasoned hardwood instead of green or damp wood. This ensures better fuel efficiency. Green or damp wood, on the other hand, produces heavy smoke and odour. Creosote is another toxic by-product that’s released when you burn wood. Left uncleaned, it can pile up in the stove’s chimney resulting in fire mishaps. It can even damage your stove. A hearth is a non-combustible platform on which the wood burning stove sits. In addition to being a safety mechanism, a hearth is also a legal requirement per the Building Regulations. The dimensions of a stove hearth should be such that it prevents fire accidents that could be caused by embers falling on nearby materials. For the best hearths, look no further than Wharfe Valley Hearths. All our hearths meet the safety regulations. They are made of premium-grade materials including granite, glass, slate and stone. We specialise in bespoke hearths – discover hearths customised to your choice of colour, shape and size. Have a professional to check your stove and chimney at least every year. An annual inspection ensures that any issues can be identified early, preventing risks of fire mishaps. The inspector can also certify if your stove is in proper working condition. With these safety precautions in place, you can enjoy the warmth of your stove with your loved ones without worry and fear! Hearths are there for a purpose – they surround the stove to prevent fire hazards from falling embers. When you install a stove, it becomes the focal point of the space. Therefore, the hearth you use should be equally fascinating. It is, therefore, important to ensure that they are made of materials that offer excellent fire safety. It is equally important that they look attractive. Why not choose sandstone hearths then? Need more reasons? Here’s a look at the benefits of installing sandstone hearth plates. Sandstone is a non-combustible natural product. It is also denser, which means fire takes more time to penetrate through this natural stone. These properties make sandstone a preferable material for building hearths. Sandstone hearths capture glowing embers, sparks and ash with great efficiency. They are great at protecting you from possible fire accidents and hazards. Sandstone exhibits excellent thermal insulation properties. They retain heat longer, which can be a great advantage during colder months when biting cold demands all the warmth you can get! Sandstone is basically grains of rock and sand-sized mineral particulates. Quartz and clay are the main ingredients of this rock. It looks like sand and is available in a variety of colours including beige, golden and grey. Whether you are looking for a brighter finish or a lighter shade, sandstone hearths are available in a riot of colours to suit your aesthetic taste and interior décor! For example, a grey hearth can be a great addition to a room with a light-coloured flooring and walls. It can also bring in a rustic effect with other elements rightly complemented! 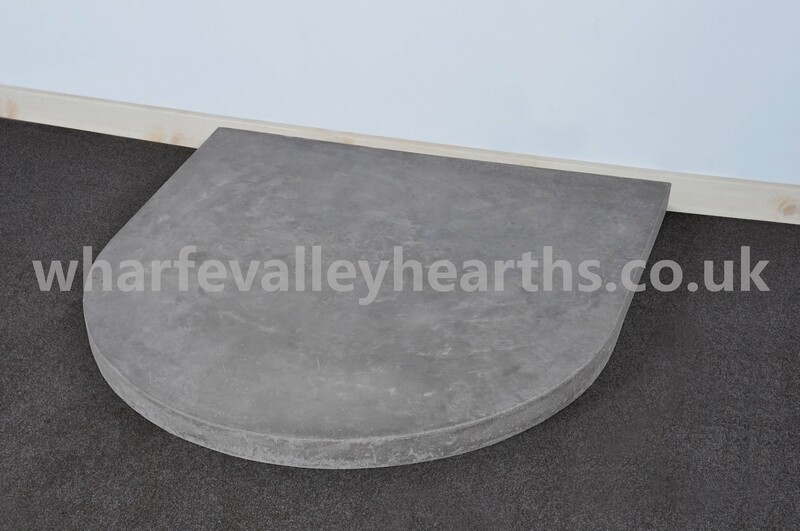 Sandstone hearths can be cut and customised to any shape. 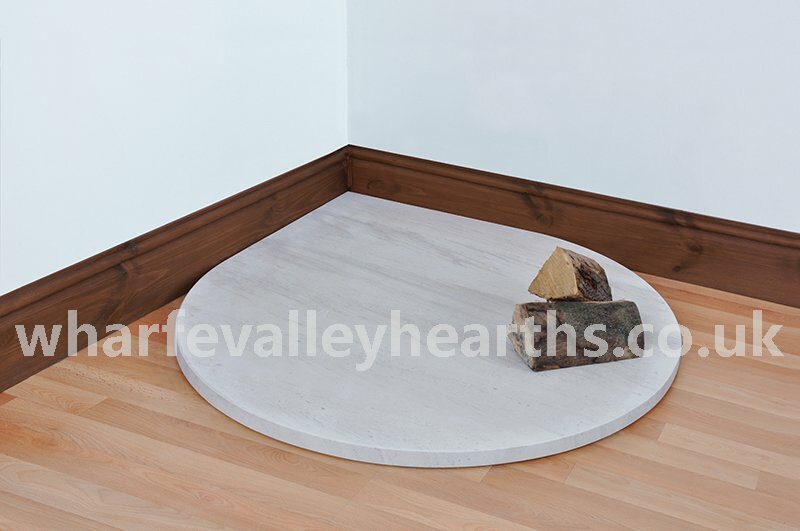 At Wharfe Valley Hearths, we offer sandstone hearths in an array of attractive shapes including teardrop, large and small semicircle, truncated, quadrant and square. This means that you’ll have a hearth that fits in anywhere in your space, be it a corner or an edge! Sandstone hearths are easy to maintain. Vacuuming can remove loose dust and dirt particles. For cleaning stubborn stains such as soot, dry clean the area with a vacuum or dry cloth first. Then, use a specialised hearth cleaner on the entire stained area. After 5 to 10 minutes, use a damp cloth on the area, gently pressing on and lifting the cloth so that the stain sticks to the cloth. Repeat till entire stain is removed. You can choose to seal the hearth to prevent staining. 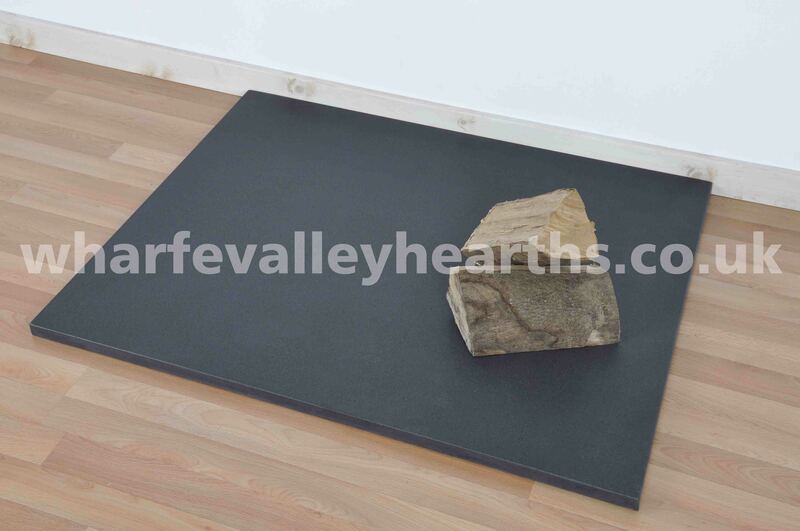 Explore a range of sandstone hearths at Wharfe Valley Hearths’ online store. Our hearths are made of premium grade sandstone, so you get an extremely durable and beautiful product. We can create customised hearths, cut to the size and shape specified by you. We also have a range of attractive colours. Hearth plates are placed underneath a standalone stove to protect your combustible flooring cover. Whether your floor covering is wood or carpet, a good quality hearth plate can protect it against any fire hazards. You can place any hearth plate that’s made of any non-combustible material. There is a wide range of materials to choose from. Here are four exciting options for you to consider. Glass stove plates are highly stylish, easy to maintain, heat resistant, and are ideal for standalone electric and wood burning stoves. Usually made of 12mm thick toughened glass, these hearths add a touch of elegance and class to any space. These are the most affordable and easy to clean hearths available in the market, and are a popular choice. Limestone is a popular natural stone that’s primarily made of a mineral called calcite. It is usually formed over millions of years by shell, sand and mud deposits at the bottom of oceans and lakes. A limestone hearth adds an instant visual appeal in any space. Limestone hearths are available in a wide range of colours and shapes. Although they are pricier when compared to glass hearths, they score highly on beauty and performance. So if you are looking for a hearth floor plate that will stand out in your room, look no further than limestone hearths. Slate is a highly unique natural stone that is highly durable and powerfully beautiful at the same time. It is known to be one of the most durable natural stones and is resistant to scratches, cracks, chips and breaks. It is a relatively high-end stone. At Wharfe Valley Hearths, you can choose from Riven Slate and Smooth Slate hearths at competitive prices. Granite is another very popular natural stone. A granite hearth will add a dash of luxury and timeless beauty to your space. It is highly durable, stunningly beautiful and adds loads of value no matter where you place it. 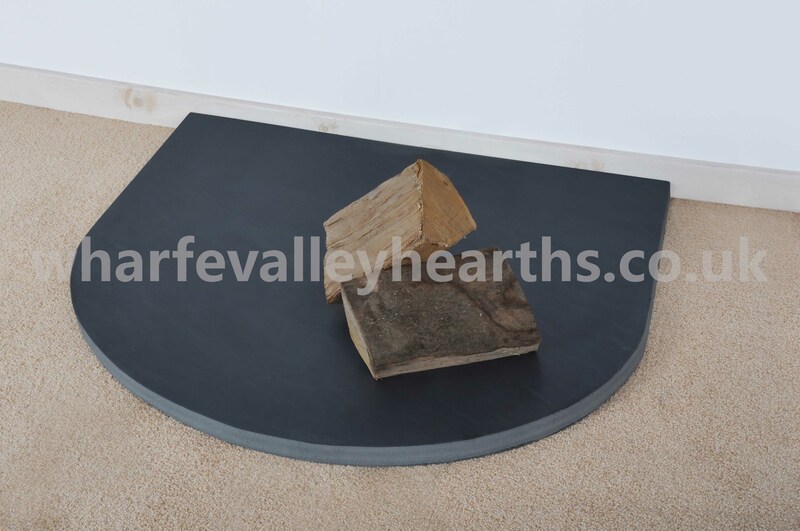 At Wharfe Valley Hearths, we offer polished granite hearths and flamed granite hearths in a wide range of shapes including teardrop, quadrant, square, semi-circular and rectangular hearths. 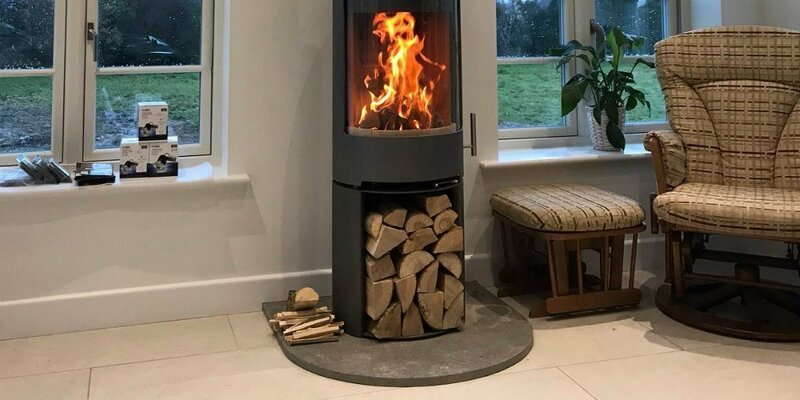 We are a leading supplier of hearths in Leeds and have built a reputation for offering high quality products at competitive prices. We offer customisation options to ensure you get a product that meets your requirements. Explore our online store right away to place your order. Hearth plates form the base of standalone stoves. Apart from looking spectacular, hearths serve a crucial safety purpose. They catch embers, ash and other by-products from your fireplace or stove, preventing them from causing any damage and thwarting possible fire hazards. The use of a hearth is a legal requirement too, under the Building Regulations Act. If you are looking to buy a hearth, why not try a limestone hearth? It boasts numerous benefits. Limestone hearths exhibit a high degree of fire and heat resistance. They are not easily damaged by falling embers and ash from the fireplace or burning stove. Hearths made of limestone are, therefore, a safer choice. Limestone hearths pack in all the fantastic benefits of the natural stone. These hearths are resistant to dents, scratches or other such damages. Limestone hearths are also super tough, meaning they can handle the stress of your stove excellently. Once you install a limestone hearth, you can safely use it for several years. Limestone hearths can be cut to any shape and size, thanks to the flexibility of the natural rock. These hearths can be shaped into any form too. As per the Building Regulations Act, a hearth must meet minimum size requirements to ensure complete safety. Given their flexibility, limestone floor plates can be cut to desired dimensions and shapes. This means that you can choose from a wide variety of shapes with limestone hearths. Hearths made of limestone are pleasing to the eye. They are compatible with any type of décor. Whether you want a natural tone or a contemporary hue, you can have these stove hearths that match your needs exactly. Limestone is an easily available rock. As a result, hearths made of limestone are affordable. At Wharfe Valley Hearths, we offer a beautiful collection of limestone hearths! We offer a variety of shapes including teardrop and semicircle in a wide range of attractive colours. Our cream stone is a wonderful choice if you are looking for a natural and light tone for your space! Our hearths are made of premium grade limestone, are extremely good looking and highly durable. We can also create and deliver custom-designed limestone hearths.